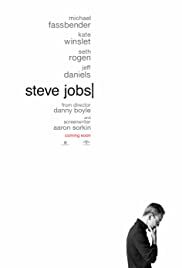 THE REVIEW: Steve Jobs is without a doubt a great film. Terrifically acted with wonderful dialogue written by Aaron Sorkin. I enjoyed this film for those two reasons: the acting and the writing. Others took qualms with the fact that this wasn’t an accurate portrayal of who Steve Jobs was and that it was highly exaggerated to highlight his negative attributes rather than focusing on the positives. This is also true, and I would consider quite clear. Now this may be because I’m a big Apple fan and am aware of much of Jobs’ history and life, including his rocky relationship with Chrisann Brennan and his daughter Lisa whom he denied was his actual daughter. These are all valid complaints and do, in some ways, detract from the enjoyment of the film. I’m always a huge fan of biopics because I get to learn something new, or see more aspects of a person’s life than I previous didn’t know about. Most of the time I don’t know better as to whether something has been dramatized or not. But whether you are or are not aware of that fact I think is secondary to the enjoyment of the film. Sorkin, as he usually does, writes words and dialogue that is so moving that you cannot help but get lost in it and feel like you are watching masters talk to one another. It’s not quite colloquial conversations, but that’s what they feel like. A Sorkin script, including his one for Steve Jobs makes you feel like you are witnessing an actual event, like you are witnessing what went on behind the scenes moments before the Macintosh was revealed to the public in 1984. For me at least, I just get so lost in the moment that I barely have time to reflect on how inaccurate a scene might be, or how much else is missing entirely. THE TAKEAWAY: What I would argue is that it is a choice, and it is the choice the filmmakers went with to focus on the “negative” parts of Jobs’ career — the early parts. We don’t get to see the iPod, iPhone, or iPad and we don’t see how nice and accepting he was at times. Perhaps that’s disappointing, and I certainly would like to see that movie, but that would be an entirely different movie. Like it or not, Steve Jobs is the movie these people chose to make and it is the Steve Jobs movie that we will likely have for a while. It is leaps and bounds above the other films that came before it (though I have yet to see Pirates of Silicon Valley which is supposed to be quite good). Definitely worthy of the nominations for Michael Fassbender (who portrayed Steve Jobs) and Kate Winslet (who portrayed Joanna Hoffman) and again, a must see for these performances alone. I think there’s more entertainment value than that, but the performances and dialogue are certainly the main draw for Steve Jobs.